1 of 3 Heat oven to 425 degrees F. Remove chicken from packaging, saving giblets for another use. Turn chicken so it is breast-side down on cutting board. With kitchen shears, cut along both sides of backbone. Set aside with giblets. Flip over chicken and press down until breast cracks and bird lies flat on cutting board. Tuck wings under breast, if desired. 2 of 3 In a small bowl, stir together marmalade, orange juice, garlic, ponzu, salt, pepper and orange quarters. Place chicken on a rack in a roasting pan. Pour sauce over chicken and add 1 cup water to pan. Roast at 425 degrees F for 20 minutes. 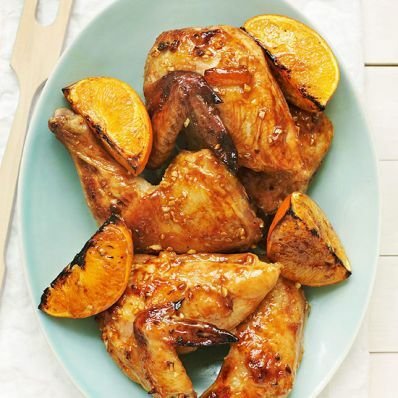 Reduce oven temperature to 400 degrees , cover chicken with foil and continue to roast for 25 minutes or until chicken registers 165 degrees F on instant-read thermometer. 3 of 3 Remove to a platter and pour pan drippings into a fat separator. Slice chicken and serve with defatted drippings alongside. Per Serving: 452 mg sodium, 3 g sat. fat, 42 g pro., 23 g carb., 9 g Fat, total, 125 mg chol., 1 g fiber, 350 kcal cal.